« The best way to save time is about not losing time. » That was one of the first sentence during the time management training I used to lead. You cannot do anything to have more time in your life, but you can do something about how you spend it. And especially how many times you are doing the same task or micro-task. We’ll tackle with that in the next practices. Everybody usually has a few tasks to achieve to reach an objective and the way you’re managing them can be a source of painful stress. 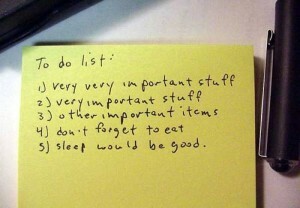 Let’s see if a todo-list can be a solution. Simple, quick, relatively efficient. Todo-listing is the number one tool to get things done, on real paper or using a software (text editor, dedicated software, ..). You can quickly clear your head by putting down all the things you have to do and update the list regularly. Limitations : you will not be able to distinguish the urgent matter of your boss and the search of gift ideas for next christmas (and you are in June). Ok, maybe if you have 3 items in your list, you will but with 10 items, the answer to « What do I have to do next ? » should be more difficult (if not try it with 30 items …). Limitations : in the first case, you have a better view of the context of each task but how to decide which is the more urgent between projects ? In the second case, you see the priority of your task but you may have to update the priority many times a day. The question is : How many times do you do that ? In both cases, you keep reading the whole todo-list to update and decide what to do next, usually after achieving each single task, which can be a source of stress too (try with 30 items, you’ll see). Limitations : you keep processing the datas of the items of your list to decide what to do next. You could have ten 5-minutes tasks for next week and two 6-hours tasks for tomorrow. And what if your boss asks you for your work load ? You’ll certainly answer : I can’t ! I have to do that, that, that and that .. which could take you maybe just a few hours .. The interesting project can go to someone else ..
You can add the duration of each tasks and you’ll be good .. but you’ll still have to process all the datas, also ensuring you’re not working more than 24 hours a day ..
How stressful a todo-list can be ? – What is your availability next week to work on that incoming file ? – The boss demands us to see him tomorrow morning from 9am till 11am to deal with the crisis on project A ! – When do you think you can write this deliverable ? I have to define the deadline with the client. – Do you manage to leave work at the time you want in the evening ? – Are you often late in your tasks ? are your commitments always fulfilled ? – How many times do you read your todo-list everyday to get things done ? This latter question is essential because each time you read your todo-list is an opportunity to stress out a little more … 15 times ? 20 times ? 25 times a day you re-read and update your todo-list, evaluating the next coming deadline, calculating your work load for the day and the next ones trying to fulfill previous commitments .. You are processing hundreds of datas on each reading with an error risk increasing with the stress ..
Maybe you like stress, then go on like that. Maybe you do not stress out, feel like doing more and more tasks ? Want to share your time management method ? And for the ones stressing out, are you looking for another way ? The solution may be in the next article ..
Cet article a été posté dans English, Time management.